Home / local news / Just a quickie: Nando's now open again. 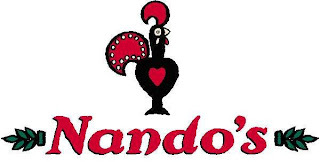 Just a quickie: Nando's now open again. Nando's re-opened for business last Sunday night.... as far as I've been able to determine, no price changes or new items on the menu. Mmmmm, Nandos. It was good 5 years ago. Haven't tried it since. I've been to Nando's twice and don't understand why it's so popular! Maybe because I'm not a meat/chicekn fan? OPNO - I say it's time to visit again! B - A fan of the wild herbs? I saw Nando's open the night before. But I am finally glad that stretch is open again. I wonder what they're doing to prevent flooding again next year, though! Apparently McDonalds is open again too, so fingers crossed Al Fair isn't far behind? It is definitely about that peri peri! I haven't tried the Nandos here in Oman...God I hope it's good. There are new items, gourmet burgers that look quite good. I have tried in Canada. Sadly, its not the same. So I spend my money on Original Nando Sauces and bake my own chicken. Actually, the wife does it, but in my defense, if I eat it, no one touches it.............with a hundred miles!